It is a specific wavelength of light that has been found to be harmful to eyes in several ways. Blue light is found in any led light source, such as computer screens. Fluorescent lights, and the sun does as well. Mostly handheld devices, screens tv. Damage to the retina, specifically the retina. There are also concerns regarding its impact on sleep, but those are still unproven. How do we counter the effects of blue light? The best way to protect your eyes is to have some protective device or screen that absorbs the blue light. That can be a screen protector, glasses or lens coatings. Many that are on the market do not absorb all the blue light, and it is important that we provide the most effective solution for our patients. 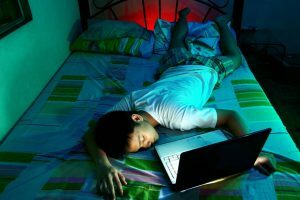 What is the relationship between computer vision syndrome and blue light? 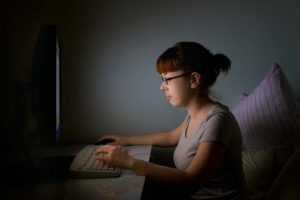 Computers alone cause strain on the eyes, but it is hard to say that blue light specifically contributes to that. What kind of lenses or eyewear do you offer to protect from blue light? Right now we offer a coating that can be used on clear lenses. However, these coatings only absorb 25-35% of the harmful blue light. Another options is blue light lenses such as Vitaris and Blue Tech, where the blue light absorption is built into the lens. These are much higher absorption, of around 60%. We also offer screen protectors for Ipads and phones, that prevent 60% of blue light. The computer screen protectors only absorb 30%, if someone is wearing glasses then blue tech lenses are the preferable method of protection. Should kids use blue light protection? Yes, more so than adults. Kids are on electronic devices that emit blue light from as young as 1 or 2. And since they have a longer life ahead they have an increased exposure to its harmful effects and therefore a higher chance of damage due to screen use. Is there a healthy amount of time to be exposed to blue light? The longer you are exposed the more damage it is causing. It should be noted that the closer the screen to your eyes the more damaging, so televisions are less damaging than computers and cell phones. If I don’t use a computer should I be concerned? If you use a phone, ipad, then you are at risk. I saw a screen protector online, do they work? Yes it does, testing has shown that blue light is reduced. However it is important to have a screen protector that has undergone testing to show its absorption. It is something to be very concerned about, because we don’t know the exact long term effects for people who have been exposed for years. How do computer glasses differ from regular glasses? The purpose of computer glasses is to take some of the strain on the accommodative system when you are looking at a screen all day long so your eyes don’t have to work so hard. What are the symptoms for computer vision syndrome? I have heard that computer glasses help bad posture and a sore back, is that true? I don’t think that is true, it doesn’t stop a person from moving around and leaning forward. Can I wear computer glasses when not on the computer? That depends on age and what prescription is needed, some people can and most people can not. That is because computer glasses are designed for closer vision and can cause blurring at further viewing distances. Should I get computer glasses with anti reflective or blue light coating? You should get both as both coatings address independent issues. Reflective coatings are helpful at reducing the glare from the computer screens and overhead fluorescent lighting. Do computer glasses help with dry eyes? No, dry eyes is helped by improving the frequency of blinking. Is there a specific brand of computer glasses that are better? There is no brand, you should look for good quality, reflective coating and blue light absorption coating. I have perfect vision do I need computer glasses? Probably yes, for the same reason as your eyes have to work harder to look up close causing eye strain no matter what your current eye sight is. Is there such thing as computer glasses for presbyopic people? Of course, because they are in more need of something close up no matter what for them to keep their head straight. If they are using a progressive type of lens and working on a desktop, their head would not be at the correct position for working on a computer. I had Lasik, should I use computer glasses? Yes, for the same reason as someone with perfect vision would need computer glasses in order to prevent additional strain on the eyes. I am on the computer all day, is there such thing as designer computer glasses? Any frame can be made into computer glasses. Visit University Optometry today for your blue light protecting eyewear consultation!